The Code introduces readers to an enriching and timeless tradition practiced for centuries in the Western Europe. 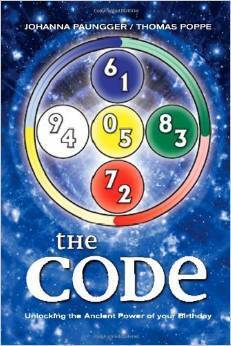 Going beyond simple numerology and mystic numbers, The Code offers a practical guide to discovering your personal tendencies, choosing a career, raising children, navigating relationships, and living a fulfilling, healthy life. Each number in your birthdate has its own unique meaning and secret attributes that influence your abilities, personality, and relationships. By integrating the power of your birthday numbers with corresponding colors, the number wheel vividly shows you how to find balance and harmony, unearth your hidden talents, and navigate daily life. For generations the number wheel has been used by the people of Tyrol to help raise children, choose a profession, learn about proper nutrition, treat illness, and make choices that promote physical and emotional well-being. The Code offers time-tested indigenous knowledge that has been effectively used for centuries.